On August 28th, New England was struck by a strong tropical storm for the first time in almost 20 years. Irene was a hurricane when it made it's initial landfall in North Carolina, then went out to see before making landfall again in Connecticut on the 28th. I had experienced Hurricane Gloria in 1985, and Hurricane Bob, which was a bust in the interior of New England, in 1991. As the storm closed in on the 28th, it was pretty clear that we were going to be east of the eye as it passed through New England, meaning that we were to be in the area of highest winds, but miss the more torrential rain on the west side. 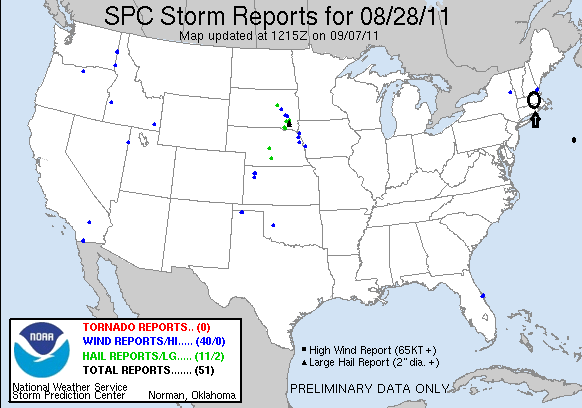 The effects of Irene had started the night before with heavy rain, but the real winds hit about 8 AM on the 28th. Once they picked up we quickly had two small sumac trees in our back yard come down, and at 11:30 or so we lost power. I decided to head out and do my NWS spotter duty. Driving through my neighborhood, it seemed like thing were pretty tame. However, by the time I reached the end of the street, all was chaos: hundreds of trees down or broken all over town. I believe our neighborhood, being on the north side of a hill and thus in the lee of the main winds, was able to get off pretty easy, though we were without power for about two days after the storm. Elsewhere in town, the tree damage was terrific, and I spotted numerous limbs hanging on wires or landed on the roofs of houses. Our town had been mostly spared the damage of the ice storm that occurred in the Winter of 2008. Because of that, it had been many years since there had been a natural event that cleaned out all of the dead limbs and trees that existed in the heavily forested town, so it seemed like it was our turn this time. Many of the towns just to the north and east of us, that had been hard hit during the ice storm, got away with little damage, and people I know who lived in those towns described the storm as "a windy rainstorm". Two trees down in the road, one having fallen from the north (left) and the other from the south (right). Every street in town had tree debris like this on it. Tree down across the wire to this house. The limbs hanging on the power lines over Rt. 85 closed to road for more than a day, and took power out in the neighborhood for more than 48 hours.